Ga achter de schermen van een van de beste televisiestudio's van Amerika met deze gedenkwaardige tour die het beste van NBC laat zien. De interactieve ervaring brengt reizigers precies in contact met de actie en omvat praktische opties die perfect zijn voor bezoekers van alle leeftijden. Bekijk de sets van Saturday Night Live en de Today Show. Film je eigen tv-segment, waarvan je een e-mail ontvangt om vrienden thuis te laten zien. Leer meer over het produceren van een aantal van de beste programmering van het land en bekijk iconische bezienswaardigheden zoals Radio City Music Hall als onderdeel van deze ongelooflijke tour. The tour starts in Central Park South and covers a variety of tv and movie spots. Our tour guide, Joe, was highly knowledgeable about not just the obvious but also some back stage stories. He spends about an hour before dropping us at 30 Rock for the NBC Studio tour portion. Our two NBC pages took us through the Nightly News Studio, Tonight Show Studio (Fallon uses the same one as Carson did in his NYC years), and the SNL set. I learned a lot during these tours. I recommend them if you are interested in TV and Movie history - just take the tour in warmer weather when the trees have leaves or early autumn. It's a wonderful opportunity getting to know how a national studio operates from the inside. The talk show we made at the end of the tour was really the highlight of my trip to New York.Lots of fun! This tour was good but the price is a bit high for what you get. It is basically two parts each lasting about an hour - part one is a walking tour down 5th Ave. which is operated by Walks of New York and part two is The Tour at NBC Studios obviously run by NBC. Overall, you can think about it like paying for two tours in one. For the walking tour, our tour guide was really friendly and conducted the tour well. The walking tour met at Pulitzer Fountain and after a brief intro took us for a walk down a busy 5th Ave down - stops included the SE corner of Central Park, the Plaza Hotel 58th St, Tiffany's The Tiffany Diamond, Trump Tower 57th St., Rockefeller Center 50th St. and finally to 30 Rock. They offer fun trivia and factoids about NYC film and TV shows but if you are already a film and TV fanatic then you should already know a good amount of it. Once arriving at 30 Rock, our walking tour guide checked our group into the official Tour at NBC Studios and we were then officially handed off to the NBC pages who conduct the Studio tour. 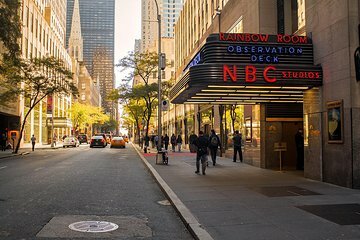 The tour included a film introduction and then looks at the Art Deco rotunda, the NBC Nightly News studio 3C, the SNL studio 8H, the Tonight Show with Jimmy Fallon studio 8G plus the Muppet Pipes and finally the NBC Production Gallery. The Studio tour is definitely the highlight especially seeing the studio 8H for me but no pictures or videos are allowed to be taken which is too bad. However, at the end of the tour, they got the entire group to film a short mock talk show in the Tour Studio of which they send you via email. It should also be noted here that If you only want to do the NBC tour then you can book directly with NBC online too. Overall, the entire two part tour was a good experience if not the best value. Was very interesting tour, loved it that we could go into the Plaza Hotel and walked around. Very interesting facts were learnt on the tour. NBC tour was quite interesting and informative. Jeff our guide was great! Rainy day and a parade in the middle of the tour and he did a great job under those circumstances. The NBC tour was a BIG disappointment. Got to see SNL, Meyers and Kelly studio and make a little video....but not the Fallon studio or any news desks. Fallon was the reason we booked a tour and the only studio we didn't get to see. I would book this tour on a weekend as apparently they have more studios to see because they are not filming. Great tour, interesting. Very knowledgeable guide. Porter was very knowledgeable and a great tour guide. Ending with the NBC Studio tour was perfect! Our guide, Porter, was great. Wonderful tour! !